Celebrate!!! Celebrate!!! Stitch to the music!!! :_) Couldn't resist! I am 99.9% DONE with the "All That Jazz" block. Just a finishing touch here and there to tie up a space and it's OUTTA here!!! Can you tell i'm happy? I'll explain more of the story behind each of the designs later. Right now...my fingers are worn to a nubbin' and a furkid needs to have her ball thrown...again!!! LOL!!! Enjoy! This is one of three pics of a block for a Spring Fling rr. Very last block I had to work on!! 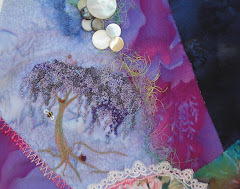 I was left with seeral small patches and those patches were patterned and challenging for me to decide what to do with them that would do the work and the block justice. Sooo, this is a vines of various flowers and a bumble bee thats turned into a mainstay for me on most blocks. I like creating them in brazilian embroidery and generally get them to come out looking pretty good. I also wrapped some grapes around the bird bath to help fill in that bit and help it combine with the other flowers more fluidly. Here's the other block for the banner. The color combos are a bit odd I admit, but it still seems to work, I think. I pulled colors from the oriental brocades that are in abundance in this block. It's done...now I can solely concentrate on the New Orleans block. I'm a little worried about time on this one. Guess we'll just have to see! Hopefully I can send it on its way shortly and there won't be any "travel" issues! :_) Off to stitch!! If I can, anyway! Phew!!!!!! I am DONEEEEEE!!!!! Goodness!!! After realizing that the colors on the block I was working on for the banner were NOT acceptable, I created two more blocks that DO fall in the jewel tone color profile...according to my search anywhoo, and this is one of them!!! I think I have permanently changed by fingerprint from all this stitching, but it's still fun!! And, if these two don't work for anyone!?!?!? I'll take em back...include em in my own wall hanging project and forgettaboutit!! LOL!!!! I used a ton of cretan, herringbone, chain and french knots in this pup. I'm finding it easier to come up with combo's as I let my mind wander and relax into the stitching! Anyway...enough rambling. I'll go post the other pic and call it good for the evening! This is the "almost" completed block that I will be contributing to my local cq association. I decided since I took the pic to do something about the dragonfly that is woven into the silk in the upper left hand corner...to help it show up better. I have been reluctant to do beading on the two blocks I am making for this project because of how it will be used. I'm concerned that they will hold up even with silamide thread. I have added some buttoms, but have them sooooo secure, I don't think they will go anywhere. That's my hope anyway! At any rate, I'll get something figured out with em. Right now, i'm running a line of french knots around the wings, then i've got to do something with the veins and body. Any suggestions? I've thought about some brazilian embroidery maybe? There are sooo many options...I probably need to just stop thinking about it and just start stitching! LOL! !